When you’ve found a winning formula, stick to it. That’s the philosophy Danny O’Brien is taking into this Saturday’s $1 million Lexus Newmarket Handicap with defending champion Shamexpress. This four-year-old speedster this morning had a leisurely hit out in an 800m jumpout at his home track of Flemington, finishing last of three runners behind Bernabeu and Va Pensiero. 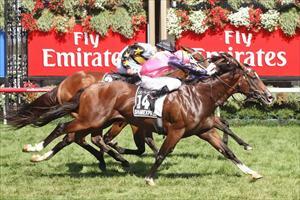 O’Brien said it was the ideal way for the son of O’Reilly to tune up for his defence of the 1200-metre Group 1. “We just let him stretch his legs, that’s usually the way we approach the straight races, particularly with him,” O’Brien said. “It’s been a good formula. Shamexpress last year rounded out his Newmarket preparations with a jumpout second placing behind Better Than Ready four days out from the nation’s most prestigious sprint. This morning he trailed the small field of three for the 800m sharpener. The John O’Shea-trained Bernabeu won by two lengths in a time of 47.41 seconds – covering the last 400m in 22.76secs – while Va Pensiero finished half-a-length in advance of Shamexpress. O’Brien’s star sprinter will be chasing history this week as only four horses have won the Newmarket Handicap two years in a row; Aspen (1880/81), Gothic (1926/27), Correct (1960/61) and Razor Sharp (1982/83). He carried 51.5kg last year and rises to 56kg on Saturday, but O’Brien said added maturity, accelerated by a trip to England last year, has him primed to offset the weight rise. His only run this campaign was a narrow second to Snitzerland in the Black Caviar Lightning, while he rounded out last preparation with another Group 1 second at Flemington, behind Buffering in the VRC Sprint Classic. “He loved the trip (to England), he spent the best part of four months being trained at Newmarket, which he really enjoyed, and he came back in the spring in terrific shape and now he’s going even better again. “His last two runs have been at weight-for-age, in the Patinack (Sprint Classic) and the Lightning, which are benchmark sprints and he’s run second in both. Shamexpress, who was ridden to victory last year by Craig Newitt but will be partnered by Damien Oliver on Saturday, occupies the $4.80 third in TAB’s Newmarket Handicap market behind Mick Price-trained pair Lankan Rupee ($4) and Samaready ($4.20). It is the $7.50 fourth pick and last year’s runner-up – Moment of Change – who O’Brien fears most, however. “Moment of Change’s autumn has been outstanding and he probably hasn’t got the credit he deserves,” O’Brien said.